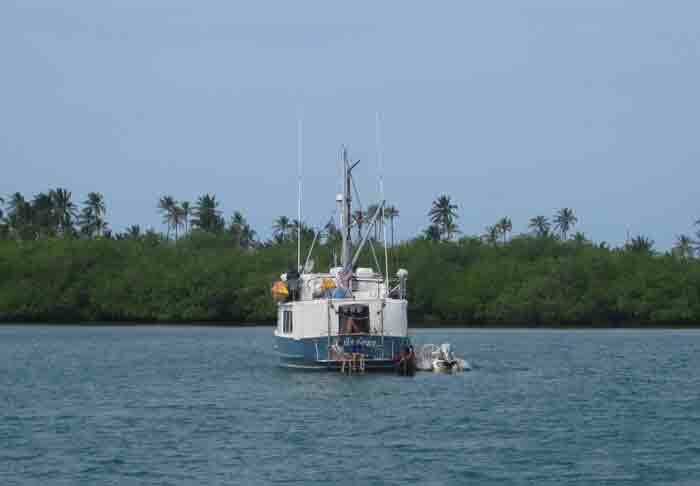 We hated having to leave Mamitupu but a major front was due to pass through with huge waves, so we decided to travel to a very secure anchorage and Snug Harbour seemed to fill the bill. It was named Snug Harbour by merchant vessels which found it to be just that. EMILY GRACE is thrilled because this is the first time they have found an anchorage with absolutely no rolling and yet we still have enough wind to make sleeping very comfortable. There are only two other boats with us and a lot of reef for snorkelling. EMILY GRACE happily enscounced at Snug Harbour. Actually that plethora of reef led me astray when I went for a long swim. I was following it as I swam along and kept sighting the corner of the small island in front of EMILY GRACE. It seemed to take a very long time. Suddenly I was out in the open ocean with enormous waves pounding onto the reef. When I got around the island, I could not see the masts of the anchored vessels. I entered a cut between the islands and gradually got into water so shallow I eventually had to creep on my forearms over the turtle grass to shore in order to walk around the patch. A passing ulu and its occupants must have thought I was a tad loco! As it turned out, I must have kept sighting on other islands to the west and circumnavigated the island we passed as we entered the anchorage! There are two resorts in the area- very expensive according to the Kunas who visited us. Their pueblo was located between them. One man offered to buy some fresh produce for us since the supply boat had been in. Unfortunately, he could not get some of the items until the next day. Then the wind and sea state made travel by ulu impossible for him and we left before we got our prepaid papaya and kuna bread! Fortunately this time we were only out by a couple of dollars!